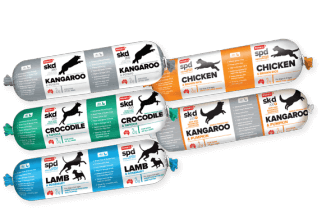 As pet food suppliers in Perth, we know the importance of providing nutritious food for your cats and dogs, each of which are unique in their biological makeup and anatomy. We stock a wide selection of raw foods for dogs, including reputable brands such as Advance cat and dog food, all designed to provide a balanced, healthy diet for your pets, ensuring their good health. As stockists of reputable brands, we are extremely selective of the products we sell, which means you can rest assured that your pet is getting the best in nutrition. All our dry and raw food products are filled with vitamins and minerals and have no additives or preservatives. Each product is researched and created with a unique blend of vitamins and antioxidants. If you’d like to know which food would best suit your dog, chat to our experienced staff who are all firm animal lovers. If you want to give your dog the best, then you need to invest in dog food that is formulated to a breed’s specific needs. Royal Canin is another one of our reputable dog food suppliers. Prescribed by vets, this brand offers a wide variety of tasty options to suit even the fussiest of palates. All dry and wet food have 50 nutrients to ensure a balanced diet. This company also knows that size matters and so does type, going so far as to provide specific food for specific dog breeds. You can give your dog exactly what it needs with Royal Canin’s breed-based nutrition. Now that’s dedication to animal health. We have exactly what your puppies and kittens need to grow into strong, healthy adults. Our Advance Puppy Plus food helps to strengthen their immune systems and grow their digestive tracts that are often a soft target for disease. These little ones require twice the nutritional needs of adult dogs, which is why we ensure that every puppy product we stock plays a crucial role in their growth, brain development and developing stronger bones. Their coats will be glossier and their skin will grow healthy as opposed to struggling with the common skin ailments that afflict many pets. Avoid these problems and save them from the discomfort, with the best products on the market. Contact us today for additional information on how we can help you give your dog and cat the best.